Very interesting yet not surprising. If you study the human body you'll realize interaction at the cellular level is very similar to reality and could be considered a microcosm of our world. 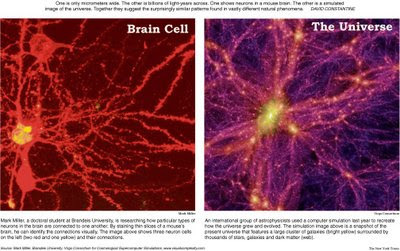 So it's not very surprising that the structure of the human brain is almost identical to the structure of the Universe. To take this one step further, Astrologers base their interpretations on the interaction of the Universe (Stars, Planets) to make predictions and of course to chart the interactions and personalities of humans by using the Zodiac system. The idea is that we live in a Universe, within a Universe, within a Universe.